"The 404 or Not Found error message is a HTTP standard response code indicating that the client was able to communicate with the server, but the server could not find what was requested." 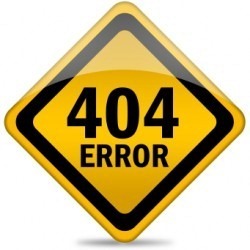 In simple words the page that will be displayed when the actual page is not found is called a 404 Error Page. Till now Blogger’s error page was a plain old design with more of orange in it and was not customizable. Now Blogger Error pages use the same template . This would help template designers in making up custom 404 Pages.This tutorial will help you in setting up a Custom 404 page for your Blog. 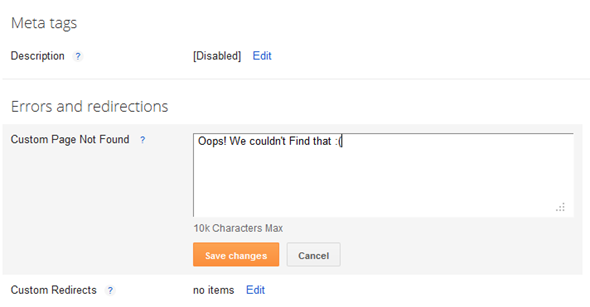 By Default, your Blogger Error page will display this error message. If you want more than just a message, then we will have to fill up this text area with some HTML Code. Now Let’s see how we can improve the look and feel of our 404 page. I would suggest you to use inline CSS styles to improve the look and Feel of your 404 message. Here is a sample HTML template which you can paste into the text box at Search Preferences > Custom Page Not Found. If you are creative, you can add more stuff to the 404 pages. You can find a list of really creative 404 pages on HongKiat for inspiration. By default the title of the Blogger Error Page is your Blog Title. If you want to change it to something else, you can Edit your template and change. And if you are using my Title Tag Hack or derivatives of that available on the internet, then you will have to change.